Khukuri House has come up with a Brand new Khukuri named "Bhojpure Royal". Sirupate and Bhojpure Khukuri, probably the most well known Khukuris by all Nepalese all over Nepal. When one Gorkha, or a common man were to mention something about a Khukur, they will not miss these two names I tell you. Khukuri House in over 25 years, when one of my local friend were to come in, they would begin with these two popular names, going "Bhojpure, Sirupate Khukuri cha sauji?" That is how renowned they are. KH always had these Bhojpure Khukuris and always loved its simplicity. It has a much wider belly unlike other khukuris and always performed well in its chopping task hence its popularity being a good tool and no wonder how it developed into a great weapon for the Gorkhali army of Gorkha along side King Pritivi Narayan Shah who we know very well how they got into the History book. This Bhojpure style khukuri was further carried on by the Royal Nepalese army becoming the most common carried Khukuri in the history. 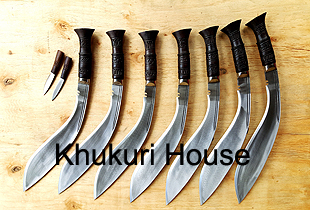 Khukuri House has done a number of new modern khukuris with guards, finger grooves handle, different shapes and they are very good in their own way but nothing is more pleasuring than to redo the Older style blade that were in existence centuries ago and to carry on its legend in its simplicity form. From KH side have only added a bit of our Nepalese artistic culture that his country is good at and it is the wood carving on the handles, a signature touch that this Khukuri is from Nepal, from the Great Craftsmen of this land.